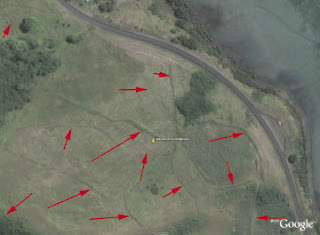 Vetiver Hedges, once planted, can stay in place for over 50 years, and as they are not invasive do not spread - the evidence can be seen from this 2007 Google Earth image of a part of Fiji that was planted with vetiver hedgerows in the 1950s’. The hedgerows are shown by the red arrows. This longevity is important as it demonstrates its cost effectiveness in infrastructure applications. It is equally important when associated with carbon sequestration as one of the principal concens is how long planting a plant to sequester the carbon in its roots will continue to maintain that function. Research carried out by CIAT in 1995 indicated that Andropogon guyanus, a closely related species of vetiver (Vetiveria zizanioides) could store as as much as 53 tons of CO2 as organic matter per hectare per year, equivalent to about 5kg per square meter. It should be noted that Vetiver grass has a much more massive root structure than Andropogon guyanus. A mature vetiver plant would take up about half a square meter of land area, making an estimated equivalent of 2.5 kg of carbon sequestered per plant. Vetiver grass produces a huge mass of roots that attain a depth of 2-4 meters after two years (see photo on previous post). As Dale Rachmeler of TVNI has stated; "Root derived soil carbon accumulation is being estimated by scientific studies across the globe under both grassland and forests, either in the tropics or in temperate areas. For carbon to truly be sequestered it must be transformed to mineralized carbon aided by the microbial activity in the soil associated with the root zones. One of the reasons for high vetiver plant vigor is a result of its mychoriza (type of soil microbiological organism) association. This association is one of the reasons vetiver hedgerows produce such high amounts of biomass on the one hand and such high amounts of carbon added to the sequestered soil carbon pool. The Vetiver Network believes that we have a means of offsetting CO2 emissions by producing an equivalent carbon dioxide savings, that is, sequestering CO2 in the soil under vetiver hedges. Vetiver hedges also have many other benefits such as soil and water conservation, pollution control, erosion control, and poverty reduction especially in the tropics. It is especially useful at the community level to provide sustainable and affordable solutions to the variety of problems facing communities who are ill equipped to deal with these problems. When you combine the CO2 offset mechanism to these other benefits and considering its ease of planting and maintenance when compared with tree planting, the argument for using vetiver becomes even stronger." Your post is truly an eye opener for those who are looking for more details on Trust Deeds Scotland. As it is a hard time for all of us, I am sure your post will be a lot of help to a lot of people. Keep up the good work.